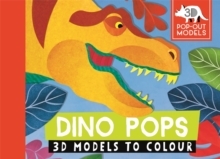 Through dramatic and striking illustrations from artist Jonathan Woodward, children can explore the prehistoric world and bring dinosaurs back to life with this collection of incredible press-out models to create. Colouring them in is a fun extra!Each simple design is reversible, with a fully coloured dinosaur on one side. On the reverse, the same design is repeated in black line for children to colour. From a stomping Stegosaurus to a terrific Triceraptops, there's a whole host of characters to meet.